1 Preheat the oven to 350° F. Grease five cups of a six-cup non-stick muffin pan with gluten-free cooking spray. Microwave or bake the bacon until barely crisp, drain on paper towels, and chop finely. 2 Combine the goat’s cheese, egg, half-and-half, nutmeg, pepper, rice flour and cornstarch in a food processor or blender and process until smooth. Transfer the mixture to a large glass cup measure with a pouring spout. Let stand for 10 minutes to thicken slightly. 3 Stir the mixture and fill five of the muffin cups about three-quarters full. (Wipe off any dribbles of batter between the cups so they don’t scorch.) Separate the bacon into five equal heaps, and sprinkle one over each quiche. Holding the pan level, transfer it to the oven. Bake for about 30 minutes, until the quiches are puffy and golden brown. 4 Place the muffin pan on a wire rack, and let stand for 5 minutes. The quiches will deflate slightly, which is normal. 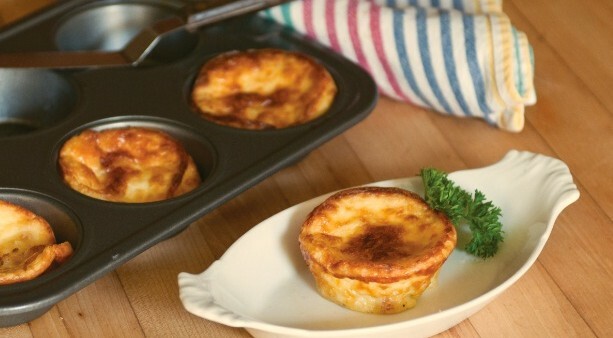 Insert a small offset spatula under each quiche, and quickly transfer to a warm plate. Two or three make one serving. As with any classic quiche, any leftovers are delicious at room temperature. Preparation time: 15 minutes. Baking time: 30 minutes. Standing time: 15 minutes. Recipe by Jacqueline Mallorca. The author of more than a dozen cookbooks, Gluten-Free Living Food Editor Jackie Mallorca’s most recent titles include The Wheat-Free Cook and Gluten-Free Italian. For more information, tips and recipes, visit her website at GlutenFreeExpert.com.